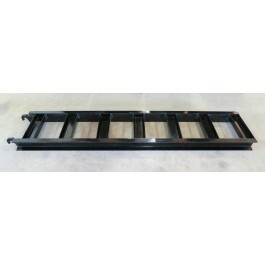 This ramp is used on most C4 and C5 trailers. ***This ramps is very similar to the 160205. The only difference is the width. This one is just about an inch wider. They may not fit well in a ramp pocket that was built for the narrower ramp. Is this the same ramp used on a 518D? It depends. Measure the width of the ramp. If it measures 13" then this is the one you need. If it measures 12" then you need the one below. This item is well built, very durable, and plastic coated finish is beautiful. Very reasonably priced! Wanted to modify the way in which the safety chains were mounted to the trailer and when I saw this item I figured that this would be a great new connection method. Items are the definition of heavy duty! Redoing a old flat bed trailer and had no idea what the axles were as far as their exact specifications. PJ's helped me to make sure that I received the perfect match to replace the old and existing suspension parts. I had no idea just how heavy duty these chains would actually be. Wanted the best and received items that exceeded my expectations and actually went far beyond all of them! This was a replacement for my plug that came out of the socket and dragged 400 miles on the highway. Probably happened going through road construction. From now on, it gets zip tied. This replacement was not as top quality as the factory, but much better than I could find in any automotive parts store. The wiring harness I ordered for my dump trailer was the exact same one I ruined. A perfect match and an easy fix. It only took a few days to get here and just a few minutes to replace. I purchased 6 D rings and a spare tire holder. The D rings are much heavier duty than I expected. I just used them to secure a 3000 pound utility tractor. I used 4 D rings and they worked fantastically. The spare tire holder is also heavy duty. I like that I can easily more it to a different location if I want to. I'm happy with the Ready system. Wow! these pipe stakes are heavy duty!! My poor wife carried 3 at a time upstairs! I can't wait to use them. 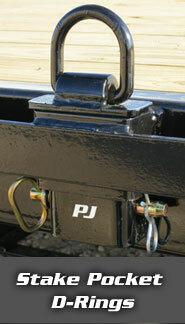 Copyright © 2013 PJ Trailers. All rights reserved.